Statistical correlation functions are a well-known class of statistical descriptors that can be used to describe the morphology and the microstructure-properties relationship. A comprehensive study has been performed for the use of these correlation functions for the reconstruction and homogenization in nano-composite materials. Correlation functions are measured from different techniques such as microscopy (SEM or TEM), small angle X-ray scattering (SAXS) and can be generated through Monte Carlo simulations. 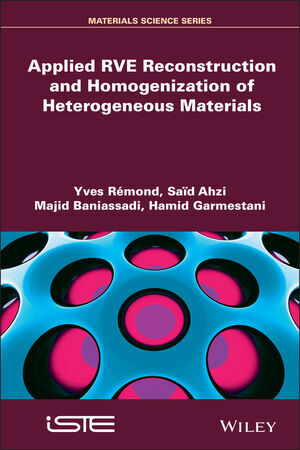 In this book, different experimental techniques such as SAXS and image processing are presented, which are used to measure two-point correlation function correlation for multi-phase polymer composites. Higher order correlation functions must be calculated or measured to increase the precision of the statistical continuum approach. To achieve this aim, a new approximation methodology is utilized to obtain N-point correlation functions for multiphase heterogeneous materials. The two-point functions measured by different techniques have been exploited to reconstruct the microstructure of heterogeneous media. Statistical continuum theory is used to predict the effective thermal conductivity and elastic modulus of polymer composites. N-point probability functions as statistical descriptors of inclusions have been exploited to solve strong contrast homogenization for effective thermal conductivity and elastic modulus properties of heterogeneous materials. Finally, reconstructed microstructure is used to calculate effective properties and damage modeling of heterogeneous materials. Yves Rémond is Distinguished Professor (Exceptional Class) at the University of Strasbourg in France. Saïd Ahzi is a Research Director of the Materials Science and Engineering group at Qatar Environment and Energy Research Institute (QEERI) and Professor at the College of Science & Engineering, Hamad Bin Khalifa University, Qatar Foundation, Qatar. Majid Baniassadi is Assistant Professor at the School of Mechanical Engineering, University of Tehran, Iran. Hamid Garmestani is Professor of Materials Science and Engineering at Georgia Institute of Technology, USA and a Fellow of the American Society of Materials (ASM International).